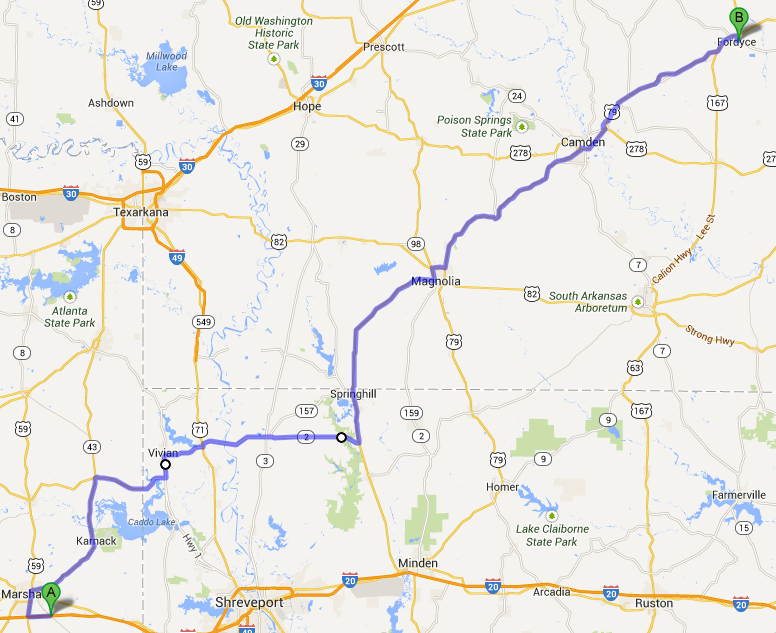 Route: Springhill to Magnolia, AR. No breakfast at the hotel, so I had a quick McDonald’s breakfast before departure. There were several hills at the start but a good start nonetheless. Most of the route was flat and I was able to make good progress until ~10:40, when an expected major storm arrived. I waited out heavy rain under some shelter in a church yard until 12:50. I only go 28- miles today, but the saddle sores have gotten the best of me. I planned for arrival at a Best Western hotel in Magnolia, which was apparently sold to private owners. Not quite the quality I had hoped for. I have to return home to catch a flight in a few days; the problem is, I don’t have my itinerary with me and don’t have anything that even suggests my flight date, so I will plan to return at least a day before my first gross estimate. I researched bus station locations but there are none until tomorrow’s city (Camden). No sweat. Magnolia is a nice little town. I like it here. This entry was posted in Cycling Trip: Sugar Land TX to Memphis TN and tagged Arkansas, Cycling, Louisiana on June 6, 2013 by nodyrb. Layover day in Springhill LA at the Holiday motel. Yesterdays ride left me completely beat, with some saddle sores that I hope are not going to be a problem. I walked about 2 miles to find a bank, to get some cash. Everything on the trip has been credit card so far. This entry was posted in Cycling Trip: Sugar Land TX to Memphis TN and tagged Cycling, Louisiana on June 5, 2013 by nodyrb. Route: Vivian to Springhill LA (Holiday motel). I started a little late. The hotel did not have breakfast, so after getting loaded and a quarter mile ride, had breakfast at a nearby Sonic ~09:50 until 10:15. The major worry for today’s ride is a rather intimidating bridge over the Red River. The road narrows down to 2 lanes with no shoulder, no sidewalk and no visibility to the other side of the bridge. If traffic from behind arrives at the same time as traffic from ahead, there is no escape route. I crossed this bridge by car on Sunday on the way down from Hot Springs, and I didn’t like it in the car. After waiting on immediate traffic from behind to clear, I pedaled up the steep bridge approach and I hope nothing arrives while I cross the bridge. At the edge of the bridge span, I also discover that there are some nasty expansion joints as well, and I get a flat tire (front) crossing the second one. The tire blows out immediately and I pedal as hard as I can to get to the other side, travelling ~25 mph with a flat tire on the front. Not an easy feeling but I survived the big concern of the day. On the other side of the bridge, there are open fields and no trees or shade. I change the tire in an open area at the end of the guard rail, with the hot 92 degree sun beating down on me. When I get to Plain Dealing, LA, I hoped to travel highway 157, and start up that route and stop for a break about a half mile in. A city police officer rolled up several minutes after my stop. It turns out that the property owner next to where I stopped didn’t like me there and “called the law” on me. The office was very nice and we had a good conversation for a few minutes. He convinced me that highway 157 was very hilly from there to Springhill, and a better route would be highway 2 through Sarepta rather than highway 157. The route is about 4 miles longer but much flatter. I think he is right, and U-turn. I make good progress for the first few miles on highway 2. I don’t know why, but today is very hard on me. The temperature is in mid-90s, and there is a at least a light headwind for the eastern portion of the trip. It is very hard riding and I have many breaks. I hate to admit to this but it took almost all day (~09:45 until after dark) to get 43.9 miles. I also had to baby some saddle sores which I was alarmed to see developing on day 2 of the ride. Somehow, I managed to reset my bike computer during the ride, and have to back-calculate my mileage and the riding stats are only for the last part of the day’s ride. Also, the battery on my GPS ran out and did a hard reset on the device (I don’t know yet if it lost any data from the day’s ride). In my younger days, I used to live in South Louisiana, and noticed several unique things about the state. The roads near where I lived were all very narrow, with no shoulders, meandering between all the little towns and country subdivisions. I figured this was related to the history of the roads, perhaps originating in the days of horses, with the roads meandering between the large plantation properties of the area. The quality of these roads left something to be desired, with many patches and pot holes, even on the busy roadways. There is a distinct contrast between Texas and Louisiana country roads. Later I will discover that Arkansas roads are also superior as well. The people in Louisiana are also not as warm or forthcoming as people elsewhere either. I noticed in my earlier days in Lafayette, LA that there was a lot of xenophobia and “us versus them” thinking in the locals. A lot of distrust of outsiders or somebody who did something differently from you or even somebody from the next town had to go a long way to earn trust. The civil war was still going on, at least in spirit. People didn’t interact; if they saw something they didn’t like, they called the authorities to deal with any perceived problem. Today’s ride took me back. This entry was posted in Cycling Trip: Sugar Land TX to Memphis TN and tagged Bridge, Cycling, Flat tire, Louisiana on June 4, 2013 by nodyrb. I wanted to start off this leg of the trip more or less where I left off in Marshall on part I. This is essentially the Marshall bus station. It turns out that it moved over the winter, from a dedicated property downtown to a corner of the Pony Express gas station, near the junction of Hwy 59 and I-20. This meant a little backtracking. No problem; a little duplication of effort. I stayed at a small family owned hotel the previous night, and arranged to leave my car for the time I was riding the bike. This first day of the second leg of my trip, I rode from Marshall to Vivian, Louisiana. The forecast called for 90 degree temperatures and 5-10 mph headwinds most of the way; judging from flags and waving grass, I think they topped out about 15 mph. This was a mostly flat and level 41.8 miles but was my first ride after a while and the heat and wind got to me. I had numerous breaks, and drank a lot of water. I freeloaded water from 2 places, a nice lady who visited with me when I had a break in front of her property, and a Baptist church. There was a mix of good roads with wide shoulder and narrow or no shoulder. I stopped for an awful lunch at a gas station in Texas. In Vivian, there was only one hotel in town, which I had located on the trip down from Hot Springs. The front desk lady was a bit surly in my interaction with her, and I was tired, so I didn’t ask too many questions at check-in. I spent some time in the room and the attached restaurant closed by the time I got to it at 21:00, and there were no others nearby. I ate some gas station food and crashed for the night. This entry was posted in Cycling Trip: Sugar Land TX to Memphis TN and tagged Cycling, Louisiana, Texas on June 3, 2013 by nodyrb. After waiting out several logistical problems and time conflicts, I was finally able to continue another segment of my bike trip from last summer. I had a little more experience and confidence about what I was doing, and as with last summer’s trip, I intended to continue towards Memphis and beyond, with the first part of the trip planned in some detail and hard plans morphing into nebulous wishes towards the end. After attending a music conference in Hot Springs (here), I left my car in Marshall, and headed out through the Northwest corner of Louisiana and central Arkansas, towards Memphis. I ended up going from Marshall, TX to Fordyce, AR before returning home. This entry was posted in Cycling Trip: Sugar Land TX to Memphis TN and tagged Arkansas, Cycling, Louisiana, Texas on June 2, 2013 by nodyrb.